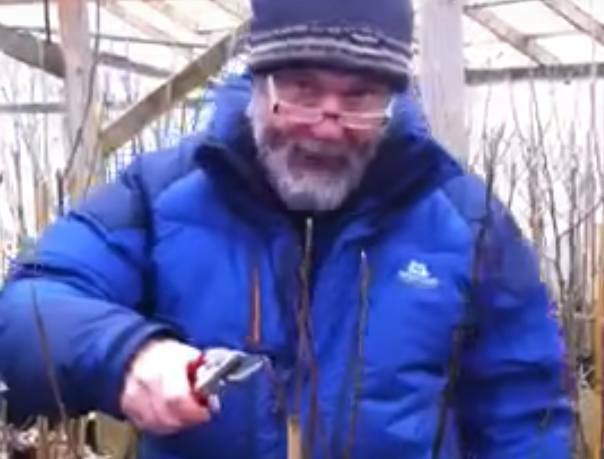 In these videos by fruit growing expert Ian Sturrock he explains the different purposes and methods of summer pruning apples and winter pruning apples. I’ve put them both together so you can see the difference without flipping pages. Winter pruning is basically undertaken to form the shape of the tree. It’s undertaken in the winter when the tree is dormant and the sap is being stored in the root system. The tree needs to balance out the root and branch systems so winter pruning will encourage growth. Ian explains bench cutting which is a system to produce rising, outward facing branches. This leaves the tree open in the centre allowing air and light to the fruit. He goes against convention by leaving a ‘pom pom’ in the centre which further encourages the outward growth of the branches by shading. Once this has served its purpose it is removed. He also explains how to encourage a strong stem by creating ‘stem builders’ when winter pruning his apple trees. The purpose of summer pruning apple trees is to reduce the foliage allowing light and air to the fruit. This results in better quality and colour in the apples. Correctly done, it also encourages fruit production for the following year. Ian explains that it is important to summer prune apple trees at the right time. This is usually August but he shows how to know when it’s the right time for summer pruning, which can vary due to location, climatic and weather conditions. This is when the soft, sappy new growth has started to lignify at the base – turned woody. Prune too early and there will be re-growth probably resulting in frost damage. Like many growers, Ian uses a modified Lorette system of summer pruning apple trees. This was devised by French grower Louis Lorette at the beginning of the 1900s and translated by William Dykes (a botanist) into English in 1925. The book Ian mentions, The Lorette System of Pruning, is difficult to obtain and will set you back at least £60! This system of summer pruning apple trees promotes regrowth from less well developed buds near the shoot base which are more likely to turn into fruiting spurs. Ian is passionate about growing fruit, mainly tree fruit, and runs a specialist nursery supplying rare Welsh Fruit Trees. He can supply these mail order from his web site across the UK.